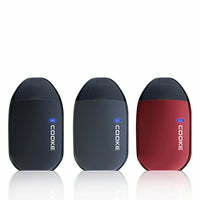 This compact and ergonomic pod mod system can come along and change your life with its functionality that will be able to impress vapers of all experience levels. You aren't going to be able to believe just how lightweight that it is until you pick it up for yourself and when you do, it's going to have you puzzled by how they are able to fit so much functionality into it. Whenever you need a device that is going to be able to come along with you and keep you craving free without adding any trouble or frustration into the mix, this is going to be it. The Laisimo Cooke 8W Pod Starter Kit by Laisimo has a 2ml juice capacity, a power range from 1 to 8 watts, has an easy to operate, one switch design and a LED indicator.